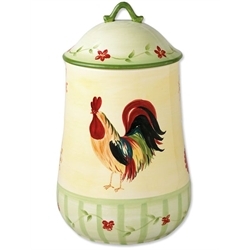 Today's giveaway is the Large Pfaltzgraff Rooster Canister. My first thought when I saw this wonderful canister is that my mother would love it. So, I would like to win it so I can give it to my mom. I'm looking forward to trying my hand at pastured poultry and working with layers soon. This canister is super cute and would be a great addition to my kitchen. My kitchen is decorated with Roosters and Chickens... I love them so much! My sister has been raising chickens for two years now, for the eggs and though I live in an apartment, we decided that we are going to raise chickens and roosters of the rare breed types. Our first attempt is the Golden Lace Polish! We will get our first shipment of chicks the 1st of May! I can't wait! This cannister would go GREAT in my kitchen! My chicks just moved outside! I built their run and they moved out to the coop on Wednesday! I miss them here next to me, chirping and clucking but they are so happy to be outside! I am sooooo happy to be raising chickens!!! What a cute canister! I really want to raise chickens, I'm still deciding if we are definitely doing it. I would put flour in this jar. I will have chickens someday (hopefully sooner rather than later) but this would be a great reminder of that dream. Not sure I can have chickens where I live (subdivision debentures) but I'd love to welcome this rooster to my home. There could be no complaint about him from the neighbors. Picking my jaw up from the floor... I love that canister!! I have a small flock of 10 laying hens and one rooster. I love watching them! It's the perfect thing to hold my hen shaped cookies! IF I had hen shaped cookies... which I will make as soon as win this great canister. I love the idea of this blog! I'm starting to raise chickens near Baton Rouge,La.. We are also starting to look at getting a few other animals, that I'll be tending. I am looking forward to following this for needed insight! I have many uses for this great Canister! Thanks again for what your doing! 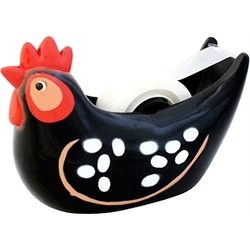 This canister would be a great addition for my collection of chicken kitchen items. Since getting my 3 girls, I absolutely am crazy about them! Hence the new kitchen collection. This canister would be absolutely perfect, perfect, perfect for holding our chickens' mealworm treats! The darn zip-lock-style bag always topples over and spills out and, when I get them in a plastic deli-style tub, a couple of chicks (we have 50 right now) fly out of the brooder, perch on the edge, and pig out. This canister would avoid all of that and would make a great addition to our brooder room! Well, poo, I might be too late for this one (?). What a gorgeous canister! Waiting for our new chicky babies in June! This would look great in my chicken-themed kitchen. My chicks are preparing for bad weather due this afternoon.